Thanksgiving can be a particularly difficult time for people living with CRPS. The holidays in general are stressful. Whether you are hosting dinner at your house or have to travel to a relative’s house, it can be stressful. However, Thanksgiving is a wonderful part of the year, as we get to reflect on why we are thankful. Sometimes, it can be difficult to be thankful when you are living with the pain associated with CRPS. But, there is always at least one reason. 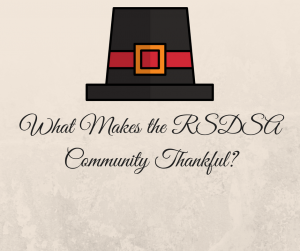 We asked members of our wonderful RSDSA community to let us know what they are thankful for this year. We received an overwhelming amount of responses. After reviewing everyone’s amazing submissions, we wanted to feature some of them in the blog. We hope that blogs like this one remind you to reflect back on the positive elements of your life. There is good in everything, sometimes you just have to search. I understand this first hand, as I am a member of the CRPS community. What am I thankful for this year? I am thankful for having such a strong, powerful community that supports one another and that is so determined to make a difference. I am thankful for the amazing support system I have, from my husband, to my mom, and the family I got to choose. I am thankful for the healing power of animals. I am thankful for each and every one of you! Here are some of the things your fellow community members are thankful for. Enjoy! “I am thankful for the people who have adjusted to the CRPS with me” -Heather P.
“I’m thankful for my eternal salvation and for God who gives me just enough strength to face each day and for all who walk with me.” -Joy K.
“I am thankful for CRPS making me the strongest I have ever had to be and learning that I can still smile through all of this pain.” -Brenda B. “[I am thankful for] a roof over my head, food in the cupboard, and my little dog who never leaves my side.” -Rochelle O. “[I am thankful] for RSD friends that I would have never met but for this monster!!! So many Warrior [sic] and so much caring and love! !” -Earl D.
“I’m actually thankful for the pain. As weird as that sounds, it has changed my life. It has forced me to slow down and enjoy the smallest things that most people take for granted. It has allowed me to learn about self love and to actually live life rather than just existing.” -Kristin M.
“I’m thankful for my support system. My mom and my aunt are experts at waiting room etiquette. I’m thankful for my doctor and his nurses. I’d be lost without them!” -Maria T.
“[I am thankful for] My pain doctor, who first diagnosed me 29 years ago next month, and whose knowledge and tenacity allowed me to talk again. He has passed away and I never got to thank him enough but he was ma saviour [sic]. RIP, Dr. S.” -Sharon V.
“I’m thankful for the very breath I breathe because I have had breathing problems before. I am thankful for my smile because I almost lost it when I was 10. I’m thankful for the pain I feel because it means that I am not paralyzed. I’m thankful for every single day that I can wake up because God has allowed me to stay on this Earth with my family for another day. I’m thankful for the life I have because I almost lost it when I was 10. I could have died from the cancer that I had at 10 so I’m thankful that I have CRPS because it’s not cancer. I’m thankful for everything I have because I’ve had less.” – Windy F.
“I am thankful for my son, I have been living with this for probably most of my entire life, I have been in very dark places, & just having him & loving him & knowing truly what unconditional love is fills my heart everyday [sic], without him I don’t know if I could fight this disease much longer, but he pushes me out of my safe places & into new adventures and levels of strength I didn’t know I had! His imagination & curiosity help me see the world in so many amazing ways, he has no clue but he has given me a piece of life I never thought I would have, 6yr old little hero, & I couldn’t be more proud of him every day! The empathy he shows others warms my soul.”- Ashley M.
“[I am thankful for] my family, Netflix, painting, and writing all help distract my pain. I am also thankful for my friends who have stuck by me and for my youth group and youth pastor and his wife.” -Makenna R.
“I am thankful for my family’s unconditional love and support everyday [sic] and in every aspect of this disease..[sic] I have six kids four grandkids and my husband..they help me in every way..even allow me to just have my meltdowns but there to pick me up after.. I truly believe that if not for them I’d be dead by now! They are my rock through this fight.”- Jeananne B. We had so many incredible responses. It was one of our most impressive comment threads. We want to know why you are thankful. We challenge you to make a video, a post, a tweet, anything to explain why you are thankful. Tag us so we can see. Happy Thanksgiving!